"With Nitric Oxide Premium™ I achieved my ultimate workout goals!" Nitric oxide supplements (with L-Arginine) were shown in clinical studies to produce greater total gains in strength and lean body mass. We're so confident that Nitric Oxide™ will work for you that we are offering a 90 day Money Back Guarantee! So, feel confident that it will work for you*, or your money back! "Not All Nitric Oxide Products Are Created Equal." Before you buy an nitric oxide supplement, it's important to know what you're buying. Fly-by-night supplement makers are rushing to create their own product and "cash-in" on this huge muscle growth and bodybuilding craze. So take your time and read the label carefully. Beware of manufacturers who claim to have the best product on the market. The reality is that most nitric oxide supplements do not live up to their claims. They are not developed with the manufacturing standards and optimal dosage found to be most effective in clinical studies. To maximize muscle growth and supercharge your workouts make sure you buy quality nitric oxide supplements that meet all of the recommended criteria. Why Is Nitric Oxide Premium the Hottest Muscle Growth and Bodybuilding Supplement Today? Nitric oxide became popular when the most famous doctor on TV discussed the benefits of L-Arginine for increasing blood circulation and cardiovascular health on his popular TV show. L-Arginine is the precursor for nitric oxide production, increased levels of nitric oxide are effective for muscle growth and body building. Now, nitric oxide is the new leader in muscle growth and bodybuilding supplements. In a study published in the Journal of Sports Medicine & Physical Fitness, scientists used nitric oxide supplements to research the effect on muscle growth and increasing greater total gains in strength and lean body mass. The clinical studies support the positive effect that nitric oxide has on building muscles and increasing strength gains. You can see the full clinical studies by Clicking Here. It's important to note that the most effective nitric oxide boosting ingredients, such as L-Arginine (AAKG) and L-Citrulline were used in the studies (exactly as found in Nitric Oxide Premium™), not a synthetic substitute. Nitric Oxide Premium™ contains the most effective nitric oxide boosting amino acids, L-Arginine (AAKG) and L-Citrulline which clinical studies show is essential for maximum nitric oxide production. Don't Get Fooled When Buying Nitric Oxide! There is a lot to watch out for when buying nitric oxide supplements. For your convenience, we summarized the most important factors to look out for. You can see what the recommendations are and where our product stands compared to others on the market. There is very specific criteria on what to look for. First and foremost, make sure it contains optimum nitric oxide boosting ingredients as shown effective in clinical studies. L-Arginine (AAKG) and L-Citrulline are amino acids essential for giving your body the ultimate nitric oxide boost. Second, it should contain a synergistic blend of significant nitric oxide boosting ingredients such as Pine Bark and Beetroot extracts, Quercetin, Fenugreek and Tribulus Terrestris to maximize muscle growth and supercharge your workout. It must contain the amino acids L-Arginine (AAKG) and L-Citrulline for the ultimate nitric oxide boosting formula. It must have no additives, preservatives or unrelated ingredients. It must contain a synergsitic blend of nitric oxide boosting ingredeints such as Quercetin, Fenugreek, Tribulus Terrestris and extracts of Pine Bark and Beetroot. It must be 100% pure and contain the ultimate nitric oxide boosting ingredients as proven effective in clinical studies. YES, Nitric Oxide Premium™ meets all of the above criteria: It does not contain additives, preservatives or unrealted ingredients and has a serving size of 2400mg daily. It is manufactured in an FDA registered and cGMP certified lab, which complies with US Pharmacopeia's quality standards. Nitric Oxide Premium™ compared to the leading brands in the industry. What About Nitric Oxide Premium™? Nitric Oxide Premium™ was created to meet the growing demands of consumers for a high quality bodybuilding supplement at the best possible price. Nitric Oxide Premium™ was formulated with specific criteria and clinical trials in mind. Nitric Oxide™ is 100% pure, and contains the most effective ingredients for maximum nitric oxide boost L-Arginine (AAKG) AND L-Citrulline. Additionally, it should contain a range of other effective nitric oxide boosting ingredients such as Pine Bark and Beetroot extracts, Quercetin, Fenugreek and Tribulus Terrestris. At Nitric Oxide™, we never use false claims or misrepresent the facts. We tell you about what's out there, what's working and why. We only quote from real clinical studies. And we will never put you on an auto-ship program. We don't believe in them. You will be billed one time and that's it. What Sets Nitric Oxide™ Apart From Other Products? Nitric Oxide™ contains the most effective ingredients responsible for the ultimate nitric oxide boost. Nitric Oxide™ contains no additives, preservatives or unrelated ingredients. Nitric Oxide™ is 100% pure with a clinically proven formula. Nitric Oxide™ is manufactured in an FDA registered lab that is cGMP certified. Nitric Oxide™ is the highest quality nitric oxide product available on the market. If you're serious about supercharging your muscle growth and revving up your workout, then don't settle for cheap imitations. Nitric Oxide™ is your best choice if you want to achieve the ultimate in muscle growth and body building. It also comes with a 100% money back guarantee because we are confident that you will see amazing results! What is Nitric Oxide & How Does it Work? OK, first things first- it is important to understand that not all nitric oxide supplements are created equal. Only a high quality nitric oxide product is going to get you the physique you want. Specifically, the most effective nitric oxide supplement contains clinically proven nitric oxide boosting ingredients such as L-Arginine (AAKG) and L-Citrulline plus has a synergistic blend of nitric oxide boosting ingredients (such as Pine Bark and Beetroot extracts, Quercetin, Fenugreek and Tribulus Terrestris) with no additives, preservatives or unrelated ingredients. Why L-Arginine and L-Citrulline? These are the amino acids proven most effective for nitric oxide production during clinical studies such as the one found in the Journal of Sports Medicine & Physical Fitness. Anything less will have a reduced impact on your muscle growth and ultimate workout results. What is Nitric Oxide and how does it work? Nitric Oxide is a free radical gas found in mammal tissue. The production of nitric oxide causes vasodilation (an expansion) in the internal diameter of blood vessels allowing them to become more relaxed which means that blood flow is enhanced, generating an increase in oxygen and essential nutrients needed to build bigger muscles. Furthermore, nitric oxide affects the release of testosterone and adrenaline, speeding growth whilst also aiding recovery time of muscles. Quite simply put, nitric oxide increases the body's potential for swifter muscle mass gain and effective recovery post workout. What is the Key to Maximum Muscle Growth with Nitric Oxide? The key to ultimate enhanced superior muscle growth is the nitric oxide boosting amino acids L-Arginine (AAKG) and L-Citrulline that work synergistically with other nitric oxide boosting ingredients such as Pine Bark and Beetroot extracts, Quercetin, Fenugreek and Tribulus Terrestris as found in supplements like Nitric Oxide Premium™. Extensive research has documented the power that nitric oxide has on increasing blood flow, oxygen transport and delivery of nutrients to muscles in humans, helping them grow. Nitric oxide production is significantly enhanced when NO pre-cursers are intorduced (such as L-Arginine and L-Citrulline), raising nitric oxide production to optimum levels, ensuring supercharged workout results, leading to superior muscle growth and enhanced performance. While many muscle growth supplements exert only one effect on the body, Nitric Oxide Premium™ sets itself apart as a dual-action solution that not only enhances muscle development during exercise, but also aids recovery after your workout. L-Arginine (AAKG) and L-Citrulline (amino acids) are precursors for nitric oxide production in our bodies. When we exercise, nitric oxide is produced naturally however, by introducing specific nitric oxide boosting ingredients, nitric oxide production can be increased leading to enhanced blood flow and oxygen throughout the body delivering the ultimate boost optimizing enhanced muscle bulk and growth. Additionally, these amino acids also facilitate the removal of exercise-induced lactic acid build-up during workouts which in effect reduces fatigue increasing endurance and extended performance. What's the Science Behind Nitric Oxide? Nitric Oxide supplements are safe and have been proven effective in clinical studies. However, some manufactures develop inferior products that reduce the effect these supplements will have on your body building and muscle growth goals. A widely reviewed clinical study of nitric oxide was published in the Journal of Sports Medicine & Physical Fitness, where they researched the effect of nitric oxide supplements on muscle growth and body mass. The clinical trial supports the positive effect that nitric oxide has on muscle growth and lean body mass. You can see the full clinical study by Clicking here. So, to recap, a premium quality nitric oxide product works to increase nitric oxide levels in the human body, which allows for increased blood flow, oxygen transport, delivery of nutrients to skeletal muscles helping them grow during your workout and recover effectively post workout. The amino acids L-Arginine AAKG and L-Citrulline, plus a synergistic blend of boosting ingredients assist in even greater production levels of nitric oxide ensuring a supercharged workout for ultimate muscle growth in the gym. No wonder it has been all over the news, for good reason. But, make sure you only buy a premium nitric oxide product, with the ultimate 'amino acid and nitric oxide boosting ingredients' that will actually help you achieve significant results, not just some powder in a pill. Study: Does Nitric Oxide Enhance Muscle Growth and Body Strength? Nitric Oxide has become the "It" muscle growth and body strengthening supplement, thanks in part to America's most famous TV doctor discussing "the amino acid, L-Arginine and its benefits for increasing blood flow and cardiovascular health." L-Arginine (and L-Citrulline) are precursors to nitric oxide production in the body. Increased Nitric Oxide enhances blood flow, feeding key nutrients to muscles, ultimately promoting muscle bulk and affecting lean body mass, while at the same time, providing benefits for fast muscle recovery. Nitric Oxide is unlike any other muscle growth and body strengthening formula on the market right now! One of the most significant clinical study on Nitric Oxide, published in the Journal of Sports Medicine & Physical Fitness, specifically uses Nitric Oxide boosting ingredients to test their effect upon muscle gains, strength and body mass. The clinical study was a randomized, double-blinded, placebo-controlled human study conducted on 22 adult males. The clinical trial divided the participants into 2 groups, an Nitric Oxide supplement group and a placebo group. Nitric Oxide in the form of L-Arginine, was administered orally for a total of 25 administrations, over a five week period. Additionally, participants were on a high intensity strength training program. At the end of the study, the nitric oxide supplement group had a significant increase in 'producing greater total gains in strength and lean body mass' compared to a placebo group. The clinical trial proved that the ingestion of an nitric oxide supplement daily during a 5-week period was shown to favorably affect nitric oxide production, leading to greater total gains in strength and lean body mass. Of further interest in this study was that nitric oxide also enhanced recovery from chronic stress by decreasing tissue breakdown. To be clear, this study specifically used L-Arginine (AAKG), which can be found in Nitric Oxide Premium™. If you are going to buy an nitric oxide supplement, make sure the label states L-Arginine: this amino acid is the most effective for increasing nitric oxide levels. Other ingredients which have been clinically proven effective for increased nitric oxide production include L-Citrulline, Pine Bark and Beetroot extracts. Why is Nitric Oxide Premium™ the #1 Choice for Enhancing Muscle Growth and Body Strengthening? Nitric Oxide Premium™ contains L-Arginine (AAKG) and L-Citrulline, the key amino acids essential for boosting intense nitric oxide levels. Nitric Oxide Premium™ has 90 capsules per bottle. Nitric Oxide Premium™ is 100% pure with no additives, preservatives or unrelated ingredients. Nitric Oxide Premium™ contains a synergistic supporting nitric oxide boosting blend including Beetroot and Pine Bark extract, Fenugreek and Tribulus Terrestris. Nitric Oxide Premium™ is the highest quality nitric oxide product available on the market. If you're serious about maximizing muscle growth and supercharging your workout, don't settle for cheap imitations. Nitric Oxide Premium™ comes with a 100% money back guarantee because we are confident that you will see, in no time at all, the ultimate in pumped muscle growth. That ripped physique you only ever dreamed of is now totally within your reach! We're proud of Nitric Oxide Premium™ and believe it is the most effective Nitric Oxidesupplement available. And we are so happy that so many of our customers agree with us! So, if you achieved enhanced muscle growth and body strengthening using Nitric Oxide Premium™, tell us about it! We would love to hear from you! -- Please Select a Subject -- I have a question about how to order Nitric Oxide Premium. I have a question about Nitric Oxide Premium. What is the status of my order for Nitric Oxide Premium. I would like more information on Nitric Oxide Premium. I would like to tell you about my results with Nitric Oxide Premium. I need to update my shipping information for Nitric Oxide Premium. I wish to return or cancel my order of Nitric Oxide Premium. I want wholesale/reseller information regarding Nitric Oxide Premium. 1. Why Choose Nitric Oxide Premium™? Nitric Oxide Premium™ is the highest quality brand for Nitric Oxide. We keep everything transparent and don't hide behind our label or our website. Plain and simple, we provide the best Nitric Oxidesupplement at the best prices. We never use false claims and will never bill your credit card for anything you didn't order - no auto-shipping! Nitric Oxide Premium™ was made to ensure the ultimate nitric oxide boosting ingredients were included, moreover, to go above and beyond to make sure you get the absolute best Nitric Oxideproduct. Nitric Oxide Premium™ is formulated using L-Arginine (AAKG) & L-Citrulline the key amino acids responsible for the ultimate nitric oxide boost. Nitric Oxide Premium™ has 60 'top-strength' capsules per bottle. Nitric Oxide Premium™ has 100% pure with no additives, preservatives or unrelated ingredients. Nitric Oxide Premium™ contains the optimum nitric oxide boosting ingredients that have been clinically proven as effective . 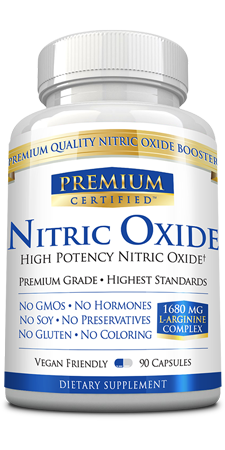 Nitric Oxide Premium™ is the highest quality Nitric Oxideproduct available on the market. If you're serious about enhancing muscle growth and building strength, don't settle for cheap imitations. Nitric Oxide Premium™ is your best choice if you want to increase muscle growth and build strength. It also comes with a 100% money back guarantee because we are confident that you will see amazing results or your money back! Our nitric oxide boosting product works by increasing nitric oxide levels in the body during workouts which allows for increased blood flow, oxygen transport and delivery of nutrients to muscles ensuring a maximum pump. Specific nitric oxide boosting ingredients will maximize the body's ability for muscle growth by significantly increasing the amount of nitric oxide that flows into the body ultimately making muscles firmer, rounder and tauter. You will be able to train harder and longer, reaching new levels in your workout as endurance and preformance is enhanced. Nitric Oxide Premium is formulated to promote consistent optimum muscle growth. You will see the incredible results in the mirror after every nitric oxide boosted workout. Extensive research has documented the power that L-Arginine (AAKG) & L-Citrulline has on increasing nitric oxide levels, leading to enhanced muscle growth and superior body strengthening. Additionally, they promote muscle recovery rates post workout. While many muscle growth and body building supplements exert only one effect on the body, Nitric Oxide Premium™ sets itself apart as a dual-action solution that not only builds muscle during workout but also helps repair muscles afterwards. Awesome! Workout Days: Take 3 capsules 30 minutes before working out (optional to also take 3 capsules in the morning). - Non-Workout Days: Take 3 capsules with breakfast (optional to also take 3 capsules at dinner). DO NOT EXCEED 6 CAPSULES PER DAY. 5. Can I see the Label of Nitric Oxide Premium™? Nitric Oxide Premium™ contains the ultimate nitric oxide boosting ingredients L-Arginine (AAKG) & L-Citrulline. Additionally, Nitric Oxide Premium provides a synergistic blend of supportive nitric oxide producing ingredients such as Pine Bark and Beetroot extracts, Quercetin, Fenugreek and Tribulus Terrestris. Nitric Oxide™ has no additives, preservatives or unrelated ingredients. 7. Are there side effects associated with taking Nitric Oxide Premium™? There are no side effects to taking a Nitric Oxidesupplement. You also want to make sure you do not exceed the recommended dose. 8. Will Nitric Oxide Premium™ really help me achieve my muscle growth and body strengthening goals? While every person is different, clinical studies have shown the effectiveness of Nitric Oxideand the benefits it has upon muscle growth and body strengthening. But results will vary per person. 9. Can I take Nitric Oxide Premium™ if I'm on other medications? Nitric Oxide Premium™ uses only the highest quality Nitric Oxideboosting ingredients. There are no known interactions with any medications, but that said, we recommend that you consult with your primary care physician if you have any concerns. 10. Where can I buy Nitric Oxide Premium™? Nitric Oxide Premium™ is only available online. You can order Nitric Oxide Premium™ from our order page by clicking here. 11. When will Nitric Oxide Premium™ be shipped out? All orders of Nitric Oxide Premium™ are shipped out within 24 hours unless it is a postal holiday or the weekend (after 10am on Friday). 12. Is it safe to order Nitric Oxide Premium™ online? Choose Your Nitric Oxide Savings Package! Nitric Oxide Premium™ was designed for the ultimate nitric oxide boost to optimize muscle growth and help achieve your bodybuilding goals with the best quality nitric oxide supplement available. We are providing a 90 day 100% money back guarantee, so you can feel confident that Nitric Oxide Premium™ will work for you. To optimize nitric oxide production to enhance muscle growth, enhance lean body mass, increase endurance and aid post workout recovery time , we have several different savings packages to offer you. We recommend trying Nitric Oxide Premium™ 6 bottle supply. The savings in the long run will be well worth it, especially when you start to see fantastic results, you will not want to stop.